The Green-Tech Fuel Processing Plant of Jaiprakash Associates Ltd. located in Dadumajra, Chandigarh was chosen for the third year in a row as the 1'st Runner Up for excellence in Solid Waste Management at the JCB CII - APTDC Solid Waste Management Awards ceremony in Hyderabad. The plant converts all of Chandigarh’s municipal solid waste into consistently high quality Refuse Derived Fuel (RDF) with low moisture content for energy recovery in power plants and cement kilns. It was set up in 2008 as a first-of-its-kind plant in India based on German technology and since then, has received recognition for indigenous and innovative technological improvements. Sports City received the “Integrated Township Of The Year” award at ET Now awards for excellence and “Township Of The Year” award at the Indian Realty Awards. Jaypee Rewa Plant and Heavy Engineering Workshop of the Jaypee Group have been awarded with renowned and most prestigious Sword Of Honour Award for 2012 by British Safety Council, UK. This award is a well acclaimed and celebrated International Award in the field of Health and Safety. Jaypee Greens received “Developer of the year North” by Estate Awards and “Realty Mughal” by Indian Realty awards. 300 MW Baspa – II Hydropower project has been awarded the “Gold Shield for 2009-10” and “Silver Shield for 2010-11” by the Ministry of Power, Government of India in the category of “performance of hydropower stations”. Mr. Manoj Gaur, Executive Chairman, Jaypee Group and Mr. Sameer Gaur, MD & CEO, Jaypee Sports International Ltd won the Global Standards Award at NDTV Profit Business Leadership Awards 2011. The award was presented by Mr. Pranab Mukherjee, Union Finance Minister of India on 7th January, 2012 at Mumbai. Dalla Cement Factory (A unit of Jaiprakash Associates Ltd.) is awarded first prize in the cement sector for the National Energy Conservation Awards, 2011. Chunar Cement Factory (A unit of Jaiprakash Associates Ltd.) is awarded the Certificate of Merit in the cement sector for the National Energy Conservation Awards, 2011. Jaypee Rewa Cement Plant and Jaype Bela Cement Plant in Madhya Pradesh of the Group have been awarded with the most prestigious “SWORD OF HONOUR” award by the British Safety Council, UK in the field of Health and Safety management system. Jaypee Rewa Cement Plant and Jaype Bela Cement Plant in Madhya Pradesh of the Group have been awarded with renowned and most prestigious “SWORD OF HONOUR” award by the British Safety Council, UK. This is a well acclaimed and celebrated international award in the field of Health and Safety management system. 3.00 MnTPA Rewa and 2.40 MnTPA Bela are the only cement plants to be bestowed with this honour in India.. 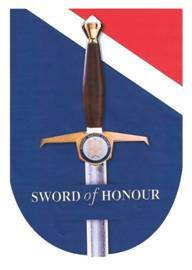 The Sword of Honour is the most prestigious international health and safety accolade that a company can receive, and it is designed to encourage and reward organizations that work with best practices. Every year swords are awarded worldwide, so winners can be assured that they are elite organizations that boast first-class health and safety for their employees. To receive a Sword, a company must be able to demonstrate its competence in managing health and safety risks. It must also have a proven culture of aiming for best practice which is promoted throughout the entire organization right from the top management to people at the shop floor. This award complements the company’s concern and focus towards Health, Safety & Environment. The garbage processing plant of Jaiprakash Associates Ltd. located in Dadumajra, Chandigarh was awarded “Excellence for the best solid waste management plant in the country” by Confederation of Indian Industry (CII). "Lifetime Achievement Award" being conferred to Shri Jaiprakash Gaur, Founder Chairman by Merchants’ Chamber of Uttar Pradesh, Kanpur for creating new milestones in Infrastructure development and his achievement in Corporate Social Responsibility for the year 2010. 300 MW Baspa – II Hydropower project being awarded with “Silver Shield” by Shri Sushil Kumar Shinde, Union Minister of Power along with Shri Bharatsinh Solanki, Union Minister of State for Power in the prestigious National Awards for Meritorious Performance in Power Sector by the Ministry of Power for 2008-09. Jaypee Rewa Plant, Jaypeenagar and Jaypee Bela Plant, Jaypeepuram (Both Units of Jaiprakash Associates Limited) were awarded Five Star Rating by the British Safety Council, London, U.K. for Health and Safety Management System. 11th F L Smidth Energy Award 2009 for reduction in Thermal Energy in clinker (Jaypee Bela Plant); Minimum auxiliary power consumption in thermal generation (Jaypee Bela Plant – CPP); Minimum Plant heat rate in thermal generation (Jaypee Rewa Plant - CPP); Minimum auxiliary power consumption in thermal generation (Jaypee Rewa Plant - CPP) were awarded by Chhattisgarh and Madhya Pradesh Cement manufacturers Associations to Jaiprakash Associates Limited (Cement Division). 400 MW Vishnuprayag Hydropower Project of Jaiprakash Power Ventures Ltd (JPVL) was awarded 1st Prize in the category "Excellence in Fast Track Power Project Execution - Hydro" by the Indian Electrical and Electronics Manufacturers Association (IEEMA) Power Awards 2008. “300 MW Baspa – II Hydropower project being awarded with “Gold Shield” by Hon’ble President of India Smt. 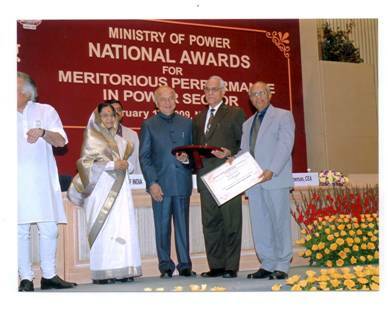 Pratibha Devisingh Patil in the prestigious National Awards for Meritorious Performance in Power Sector by the Ministry of Power for 2007-08. Smt. Pratibha Devisingh Patil, Hon’ble President of India along with Shri SushilKumar Shinde, Hon’ble Union Minister of Power handed over the awards ata ceremony at Vigyan Bhavan, New Delhi on 17.02.09. The award was received by Shri J.N. Gaur, Director Incharge & CEO and Shri Kanti Prasad, Jt. President on behalf of Jaiprakash Hydropower Ltd.
Ministry of Power has instituted a Comprehensive Award Scheme for improving the overall performance of the power sector, to inculcate a competitive spirit and to motivate the power utilities / franchisees to achieve higher levels of performance. 300 MW Baspa Stage II Project in Himachal Pradesh is the first Independent Power Producer (IPP)project after the Government of India liberalized the power policy by inviting private sector participation for setting up hydropower project on “BOO” basis. .
“Entrepreneur of Year Award” being conferred to Shri Jaiprakash Gaur, Founder Chairman for his exceptional contribution in Infrastructure & Construction sector by Ernst & Young . 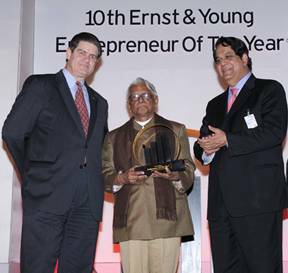 Shri Jaiprakash Gaur, Founder Chairman, Jaypee Group being conferred the E & Y “Entrepreneur of the Year Award” 2008 by Mr. K.V. Kamath, MD & CEO, ICICI Bank along with Mr. James S. Turley, Chairman & CEO, E&Y. For the Yeoman service, which Shri Jaiprakash Gaur has given to the nation in development of Infrastructure projects and more so in construction of hydropower plants in midst of most challenging situations, he was conferred the Ernst & Young Entrepreneur Year Award for outstanding contribution in the field of Infrastructure and Construction in a sober yet graceful ceremony in Mumbai on 26th November 2008. Award presented for Overall Performance, 'Use of Explosives & Dust Suppression and Safety Education during Metalliferous Mines Safety Week Celebration (Jabalpur Region) to Naubasta Limestone Mine of Jaiprakash Associates Limited. National Safety Award for the year 2006 to Jaypee Rewa Plant for longest Accident Free Period. PHDCCI Good Corporate Citizen Award 2007 awarded by Shri. Montek Singh Ahluwalia, Deputy Chairman, Planning Commission, Government of India. Shri. Montek Singh Ahluwalia, Deputy Chairman, Planning Commission, Government of India on the occasion of presentation of the PHDCCI Good Corporate Citizen Award 2007 to Shri Harish K. Vaid, Sr. President (Corporate Affairs) & Company Secretary of the company. 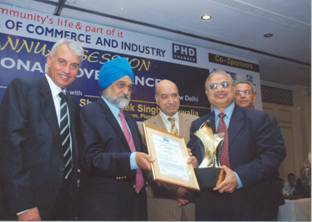 Jaiprakash Associates Limited, the flagship of the Jaypee Group received the Good Corporate Citizen Award presented by the PHD Chambers of Commerce & Industry for the year 2007. The award was presented at the 102nd PHDCCI annual session. The award was instituted by PHDCCI in 1997 to recognize organizations that have high standards of Corporate Governance and has made an outstanding contribution to Social Development and Community Services. Narmada Award for Overall Performance, Sonebhadra Award for Community Development & Award for Waste Dump Management, Water Quality Management, Publicity & Propaganda received by Naubasta Limestone Mine of Jaiprakash Associates Limited during Mines Environment & Mineral Conservation week. Award for Management of Sub- Grade Mineral received by Jaypee Limestone Mine of Jaiprakash Associates Limited during Mines Environment & Mineral Conservation Week. 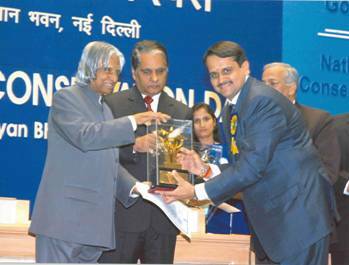 National Energy Conservation Award 2005, for cement sector conferred by Govt. of India, Ministry of Power. Dr. A.P.J Abdul Kalam, Former President of India on the occasion of presentation of the National Energy Conservation Award 2005 to Shri Sunny Gaur, Managing Director (Cement), Jaiprakash Associates Ltd.
Award for Overall Performance, Water Quality management and Community Development received by Naubasta Limestone Mines during Mines Environment and Mineral Conservation week. Award for Waste Dump management received by Jaypee Limestone Mines during Mines Environment and Mineral Conservation week. FLS (Fuller Smidth) Energy Award for Reduction in Electrical Energy in Clinker (Jaypee Rewa plant unit), Lowest Thermal energy in Clinker (Jaypee Bela plant) and Minimum plant Heat Rate Kcal/Kwh in Thermal Generation (Captive Power plant). Lifetime Achievement Award conferred upon Shri. Jaiprakash Gaur by Builders Association of India in recognition of outstanding contribution to Indian Construction Industry. FIMI’s Environment Award “Abheraj Baldota Environment Award” for Naubasta Limestone Mine. Award Presented by Indian Bureau of Mines During Mines Environment & Mineral Conservation Week (Jabalpur Region) to Jaypee Rewa Plant for Overall Performance, Afforestation and Water Quality Management. Award Presented by Director General Mines Safety During Metalliferous Mines Safety Week Celebration (Jabalpur Region) to Jaypee Rewa Plant for Transport of miners & overburden etc. Award Presented by Director General Mines Safety During Metalliferous Mines Safety Week Celebration (Jabalpur Region) to Jaypee Bela Plant for Overall Performance, Standard of working & House Keeping. Indian Economic Development and Research Association National Award for outstanding contribution in the field of mining by Jaiprakash Associated Limited. F.L. Smidth Energy Award, Presented by MP Manufacturer’s Association to Jaypee Bela Plant for Lowest Thermal Energy Consumption. National Award for Meritorious Performance in recognition of the outstanding performance of the 300 MW Baspa II- Hydro Power Station was awarded by Hon’ble Prime Minister of India, Dr. Manmohan Singh. National Award for Environmental Excellence in Limestone mines associated with Jaypee Rewa plant. National Safety Award, Presented by Govt. of India, Ministry of Labour to Jaypee Rewa plant for Longest Accident Free Period. National Safety Award, Presented By Govt. of India, Ministry of Labour to Jaypee Rewa Plant for Lowest Average Frequency Rate & Longest Accident Free Period. National Safety Award, Presented By Govt. of India, Ministry of Labour to Jaypee Bela Plant for Lowest Average Frequency Rate. National Safety Award, Presented By Govt. of India, Ministry of Labour to Jaypee Rewa Plant for Lowest Average Frequency Rate. National Safety Award, Presented By Govt. of India, Ministry of Labour to Jaypee Rewa Plant Longest Accident Free Period. National Safety Award, Presented By Govt. of India, Ministry of Labour to Jaypee Bela Plant for Longest Accident Free Period. Fuller Energy Consumption Award By M.P. Cement Manufacturer’s Association for Lowest Thermal Energy Consumption in Clinker Production, Cat. 3 in M.P./ Chattisgarh. National Safety Award ( both units), Presented By Govt. of India, Ministry of Labour for Lowest Average Frequency Rate & Longest Accident Free Period. National Safety Award, Presented By Govt. of India, Ministry of Labour for Longest Accident Free Period. Fuller Energy Consumption Award, Presented By Federation of Indian Mineral Institute for Lowest Thermal Energy Consumption in K Cal per kg. of Clinker Production. Fuller Energy Consumption Award, Presented By M.P. Cement Manufacturer’s Association for Lowest Thermal Energy Consumption in Clinker Production, Cat. 3 in M.P./ Chattisgarh. M.P. State Inter Industry Safety Award, Presented By National Safety Council for achievements in the Field of Industrial Health, Safety & Environment. National Safety Award, Presented By Govt. of India, Director General, NCB, Ministry of Power for Best Improvement in Energy Performance.